At the Belkin Art Gallery, we often receive questions about public art on campus, how artworks come to be sited at the University, how they are funded and what is involved in their ongoing care. Responding to this growing interest, we will be issuing outdoor art updates to share news and provide backstory information about what is involved with curating, stewarding and activating the University’s outdoor art collection. In this issue, we trace the story of Cumbria by Robert Murray, an artwork that is being refurbished and relocated to a site befitting of its importance. We also feature two artists-in-residence projects chosen for how they respond to the context of the university as a place of curiosity, ideas and exploration. Situated as we are on the traditional, ancestral and unceded territory of hən̓q̓əmin̓əm̓ speaking Musqueam people, we encourage projects that honour the long history of learning that has taken place here. The University is a place of experimentation and free exchange of ideas and public art is an important part of that. Residencies are a focus for new outdoor art commissions, an approach that brings artists together with different communities, faculties and disciplines to develop artworks through research and engagement. The first example of a project that developed through research over time and in reference to this place was The Shadow by Esther Shalev-Gerz. 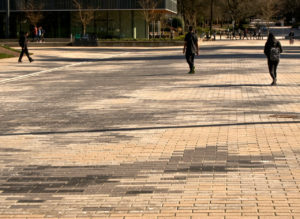 Officially launched in September 2018, the artwork on University Commons Plaza presents the shadow of an old-growth fir tree, a species that once grew in abundance across this site. To mark the artwork’s launch, the Belkin commissioned an original composition by UBC School of Music DMA student Ramsey Sadaka that was performed by solo flutist Emily Richardson. In the weeks leading up to the launch, the Belkin offered tours of campus trees led by UBC Botanical Gardens horticultural educator Egan Davis. Spanning the last seven decades, each of the twenty-five artworks in UBC’s Outdoor Art Collection represent different conditions of acquisition and measures of importance. Cumbria (1967/1995) by Robert Murray marks a pivotal moment in the history of sculpture and the evolution of art in public space, not only on the UBC campus, but in cities across North America. It was in the 1960s that we began to see sculpture untethered from the functions of architectural decoration or commemoration. Moving away from the tradition of representation, artists were experimenting with abstraction and the fundamentals of form: mass, volume, plane, line and colour. Often deceptively simple in their configurations, these works embraced industrial materials and processes and implicated space and context in new ways. Cumbria made its debut at Toronto’s Sculpture 67, which was one of the first outdoor art exhibitions in Canada to present contemporary sculpture outside the confines of the gallery, an undertaking that involved temporarily siting large-scale works around the grounds of Toronto City Hall. This exhibition was conceived at a time when planners were re-envisioning city building and exploring the role that public art might play in urban renewal – an investigation that preceded the establishment of percent-for-art public art programs taking place in cities worldwide from the late 1980s onwards. 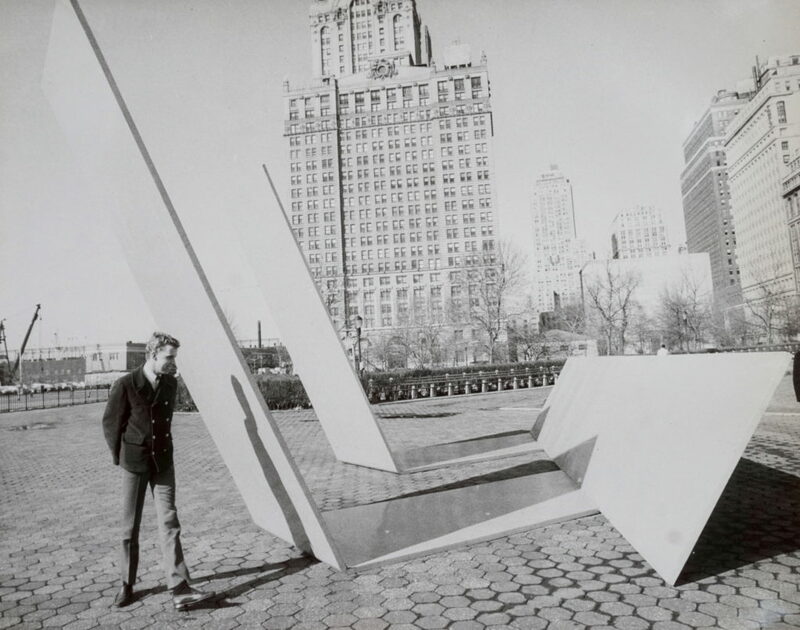 In the Fall of 1967, Cumbria travelled to New York and was shown again in an outdoor setting, this time within the context of another ground-breaking exhibition, Sculpture in Environment in Battery Park. In both situations, the siting and orientation of the sculpture were extremely important to Murray. In a statement about the making of this work, Murray spoke of how he was prompted by a feeling for two pieces of steel, each weighing five tonnes, and how they could shift from being understood as a long narrow line to that of a hanging heavy slab, or to a weightless spread of colour. He sought to undermine any preconceived ideas about the sculpture’s gestalt, allowing one’s perception of the work to unfold as they moved around it, forming an understanding of its totality only after experiencing it from different viewpoints, both near and far. Cumbria was purchased by Transport Canada and returned home in 1969. It was installed in a less-than-ideal setting beside a gas station on Grant McConachie Way, the thoroughfare that led to the then newly-opened Vancouver International Airport. This siting afforded no opportunity for experiencing the artwork beyond that of a glimpse from inside a passing vehicle. In 1993, the airport removed Cumbria and in the process, it suffered significant damage. The sculpture remained in storage for two years before a campaign to save it was spearheaded by artist Toni Onley. Transport Canada donated the artwork to UBC, funding its refurbishment and siting between the Belkin Art Gallery and Lasserre Building. At this time (1995), Cumbria was the first large-scale public sculpture to be installed on campus since 1975. Twenty years later in 2015, the sculpture was removed for repair and maintenance with the intention of relocating it to a new site that will provide the kinds of conditions the artwork was originally intended for. 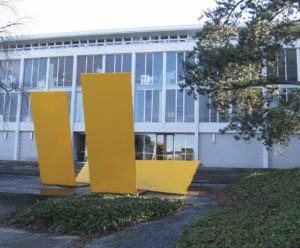 After exploring a number of possible locations at the University with the artist, the wide boulevard at West Mall and University Boulevard proved to be the most desirable site for the “harvest yellow” modernist sculpture. This proposed site affords distant views from the four cardinal directions and from the windows of surrounding buildings. The work will be in close proximity to pedestrian routes, the neighbouring outdoor classroom and other places for stopping, sitting and looking. It is hoped that here, Cumbria will take up residence as an artwork that speaks to a seminal moment in </>the evolution of art in public space. In mid-January, Campus and Community Planning will host an open house to present the revised landscape plan that includes the integration of Cumbria. See planning.ubc.ca for more information. Artist-in-residence programs hold terrific potential to generate new approaches to collective knowledge production as distinctive as the art they produce. UBC’s interdisciplinary academic culture has proven an ideal environment for attracting artists working across all manner of disciplines to participate in artist residencies for the benefit of artist, scholars and students. Vancouver artist Laiwan is presently winding down a residency on campus with the Department of Earth, Ocean and Atmospheric Science as Vancouver artist Holly Schmidt’s residency with the Morris and Helen Belkin Art Gallery is in nascent form. In early 2017, Laiwan received a commission from Translink to produce a public artwork to accompany the refurbishment of the 22nd Street Station in New Westminster. The station overlooks the Fraser River and the Queensborough and Alex Fraser Bridges that connect the Fraser’s north and south banks; the former connecting the easternmost end of Lulu Island and New Westminster’s island neighbourhood, Queensborough, while further off, the latter connects Annacis Island to North Delta. It is a view of interconnection; it is a view on an ecosystem in constant motion. It is a metaphor for Laiwan’s work for the site and for the residency that made the work possible. Struck by the idea to inject light into the heretofore gloomy exterior of the 22nd Street Station and incorporate the River in her commission, Laiwan began by zooming up and out from the station through the virtual space travel afforded by Google maps. From above, Laiwan observed that the architecture and setting of the station resembled the microscopic species phytoplankton. Given that phytoplankton are known for creating their own light, her idea took shape from there. Laiwan’s research took her to the resource, “Phyto’pedia”, an online encyclopedia featuring an extensive database of high-resolution images and descriptions of a wide variety of genera and species of common phytoplankton from the British Columbia coast. The detailed resource (it is used worldwide by organizations such as NASA and the Smithsonian Institution) prompted Laiwan to reach out to Dr. Tara Ivanochko, Director of Environmental Science with the Department of Earth, Ocean and Atmospheric Sciences (EOAS) with a proposition to join the Department as an artist-in-residence to explore the species and characteristics of phytoplankton in the Fraser River with the ready awareness that these river phytoplankton are not bioluminescent. Despite the absence of additional funding for the undertaking, Dr. Ivanochko understood that this residency presented a unique learning opportunity for a selection of advanced students and the department at large and she contacted the Belkin to seek guidance on setting up such an artist-in-residency for Laiwan. 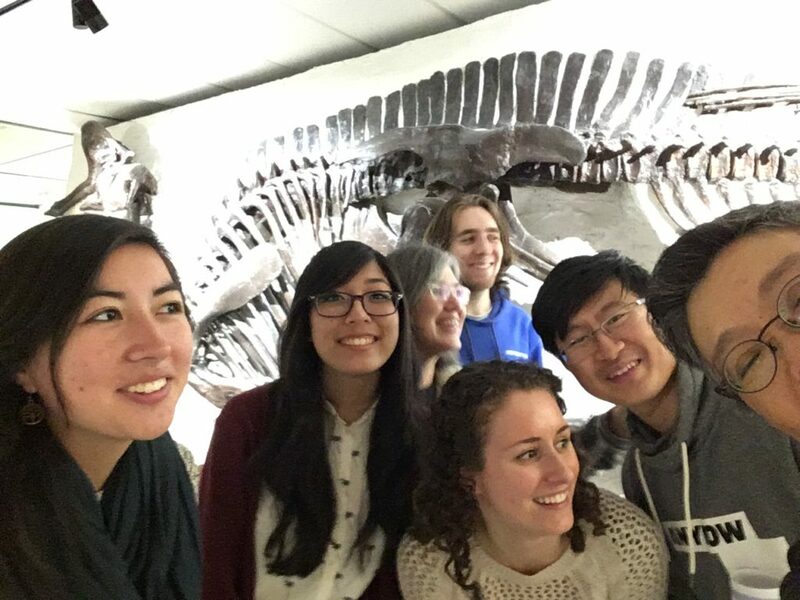 Dr. Ivanochko recruited five advanced students across a range of backgrounds and experience in oceanography and environmental science to participate in an upper level directed studies course working with and alongside Laiwan. Coursework included a field component through which they collected, appropriately enough, twenty-two phytoplankton samples from the area in the Fraser River just below the future site of the public artwork to which their research will contribute. In the lab, the students carefully identified and photographed each sample; these photographs form the central component of Laiwan’s project. Laiwan was an enthusiastic and inquisitive participant in the seminars and as part of the shared learning process she had students record and circulate their feelings about and experiences with the Fraser River. During weekly seminars, each student presented research on different aspects of the River from its chemistry to its physics to its cultural history. Through the course of the field and lab work, they documented twenty-two samples in total, an amount representative of the number naming the street identifying the Skytrain station. The participation of the students and the Department will have a lasting presence in Laiwan’s work and with the thousands of people who use 22nd Street Station every day. While the final details of the artwork Laiwan produced through her residency remain under wraps until the spring of 2019, Holly Schmidt’s multi-year residency at UBC is in its beginning stages. Through the Outdoor Art program and with the Belkin Art Gallery as lead partner and facilitator, Schmidt will work in the spaces between the buildings through a process of collective knowledge production within the environment of the University, itself upon the traditional, ancestral and unceded territory of the Musqueam people. Schmidt’s artistic practice thrives in the interaction between theoretical and practical knowledge and through collective processes of self-organization. Researching the writing of anthropologist Anna Lowenhaupt Tsing, Schmidt was interested in her description of interspecies collaborative survival, a process that embraces interdisciplinarity. Schmidt will be working from a methodology of slowing down, taking notice and learning from plants as teachers. 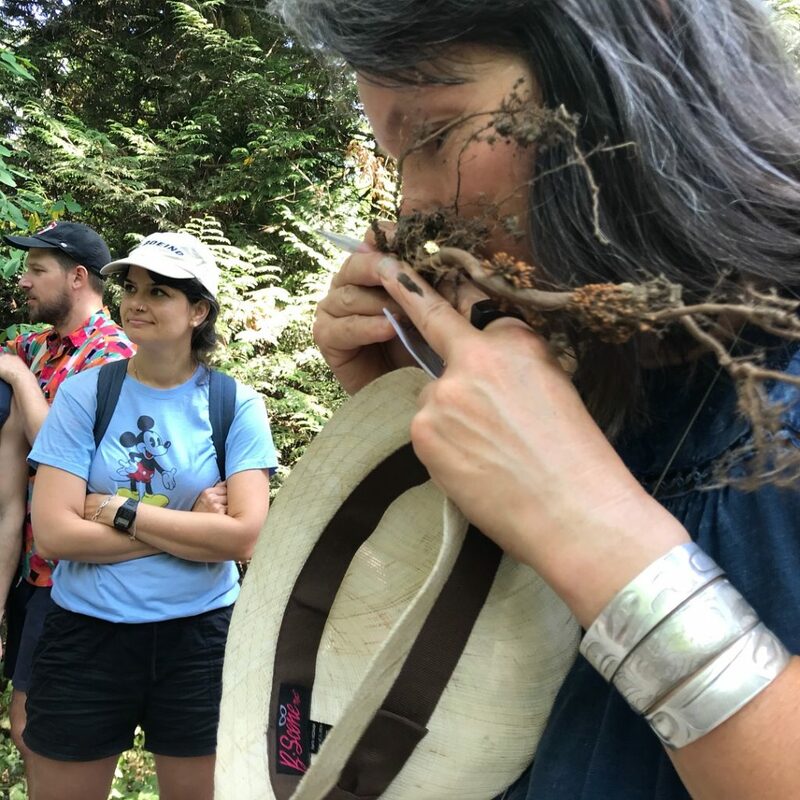 Inspired, and indeed directed by the plant life and patterns of growth, decay and germination on campus/Musqueam territory, she anticipates the outcomes of her project will emerge through the process of the residency itself. Shortly after the completion of Laiwan’s residency, a postdoctoral fellow in the Department of Earth, Ocean and Atmospheric Sciences approached Dr. Ivanochko to seek advice on how she might go about setting up another artist-in-residence program in the Department. The success of Laiwan’s residency for the artist, for the EOAS and ultimately for the thousands of people who will daily experience the resulting work in New Westminster incorporating the scholarship produced by UBC students provides one exceptional perspective on the value of artist-in-resident programs at UBC. As Schmidt begins work on campus in earnest in the new year, demonstrating a different approach to Laiwan’s, both exemplify two of the many different ways in which artists-in-residence challenge and inspire new and unique interdisciplinary approaches to research. How do artworks in the outdoor art collection get selected? Artworks that enter the outdoor art collection undergo a rigorous process of approval. Whether a donation of an already existing artwork or a proposal for a new commission, the Curator of Outdoor Art’s first step is to present recommendations for new acquisitions to the Outdoor Art Subcommittee. This committee in turn makes recommendations to the University Art Committee (UAC), who forwards their recommendations to the Provost for final approval. The UAC has representation from the student body, faculty and external community, all of whom have strong interests or areas of expertise in the visual arts. How are the artworks funded? Artworks are funded through grants and private donations, which may be matched from a university fund for public art. This fund was established using infrastructure charges paid by developers on campus. Who is responsible for maintaining the outdoor art collection? The responsibility for maintenance is shared with UBC’s Building Operations but also involves the expertise of a range of conservators, trades and design professionals. As the campus evolves, some artworks in the Outdoor Art Collection require relocation, a process that involves consultation with the Musqueam community, the artist or their family, the campus landscape architect and planners. Vancouver interdisciplinary artist Laiwan collaborates with virtuoso bass clarinettist Lori Freedman from Winnipeg to premiere this multimedia artwork. Playing on the idea of millennial year (4698 and 5760 are the Chinese and Jewish years respectively for 2000) Quartet uses 16mm film, music improvisation, live performance, sculptural installation, computer media and the internet. It is a celebration of our improvisational musical body, spontaneous time and space, and the presences/absences of cultural histories within a critique of the limitations of machines.